I’m discovering new ways to relax in my garden. I don’t have to just sit out in the garden, looking and reading. I can relax while I’m doing. Just as well because my raspberries have appeared two weeks early this year because of our early summer weather. So for the next few weeks I’ll be out there almost daily picking raspberries. Then there are the roses. The white ones in front were spreading their branches and flowers all over the place including over my driveway. I don’t drive but some of my friends do, so to avoid any vehicles brushes against the roses, I cut the bushes back. I’m not sure my late mother actually sat and relaxed in her garden, except when I was a toddler –and here the photos tell that story. Mom was always out in the garden picking red raspberries, beans, and currants, until she persuaded me to do so. I loved picking beans and raspberries, but not the currants. They don’t taste good raw and they seem to attract bees. Mother’s busyness in her garden paid off in the many fresh raspberries, plus her own version of canned currant jam and jelly and mustard beans – the latter I’ve never been able to find since. And unlike me, she pruned her raspberry bushes properly so she didn’t have to pick in a maze the next season. I use the “hit or miss” procedure although I do keep in the new shoots for next year’s berries and cut back the deadwood – what I can reach. Somehow I don’t get it as smooth and clean as Mom did. Maybe, Mom did relax in her garden after all – by picking berries and trimming the bushes. 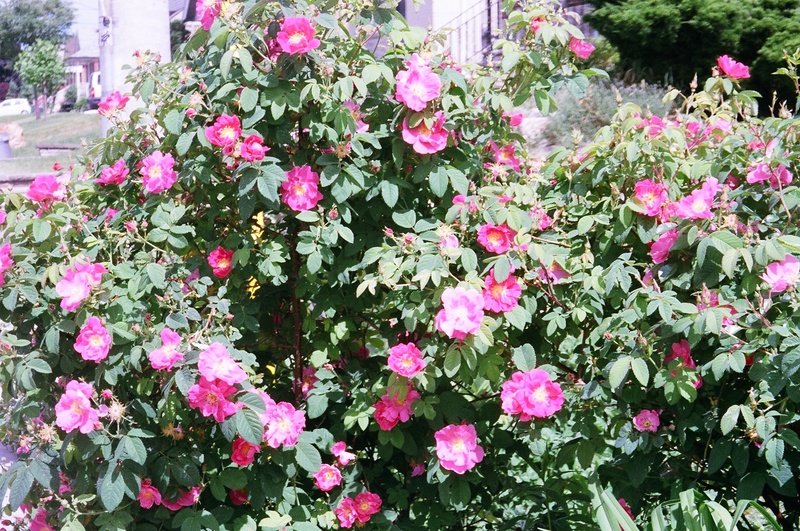 Then there were her rose bushes – but that’s for another post. For now, those of you in Canada, enjoy the July 1 Canada Day holiday weekend coming up and those in the United States, enjoy your July 4 holiday…in a garden, if possible. Next week I’ll get more serious. 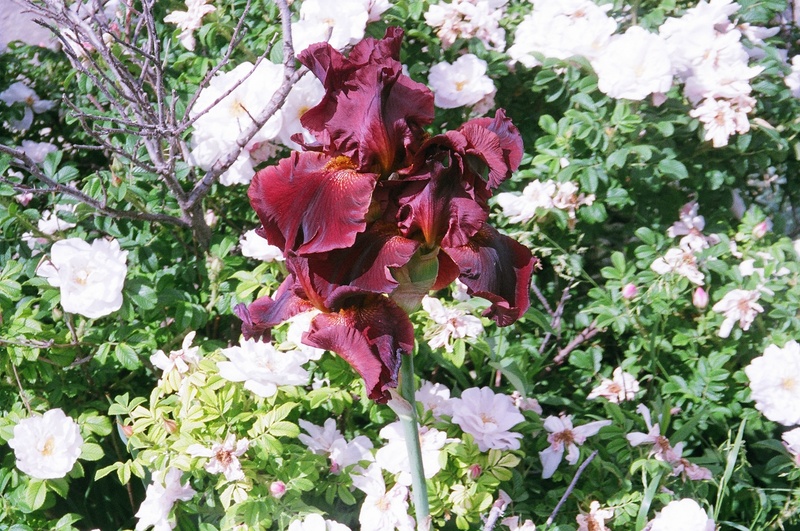 Meantime, I’ve added a few more pictures of my garden. 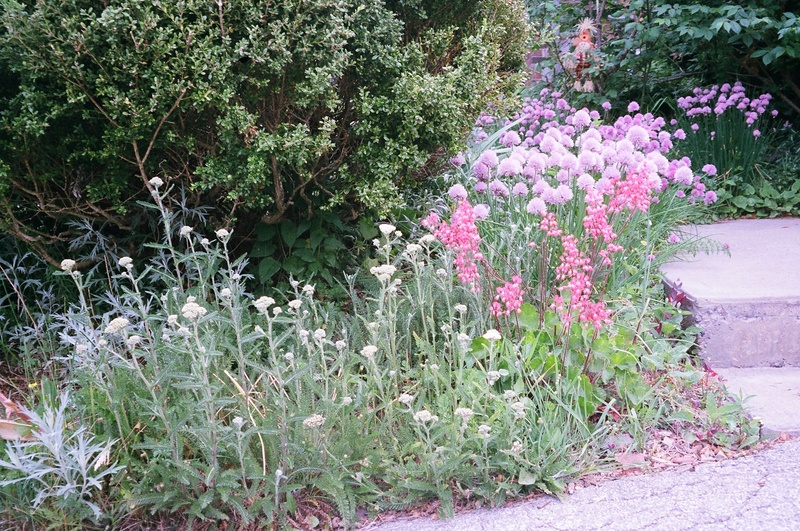 Front view by steps to veranda shows yarrow, coral bells, chives under the boxwood. 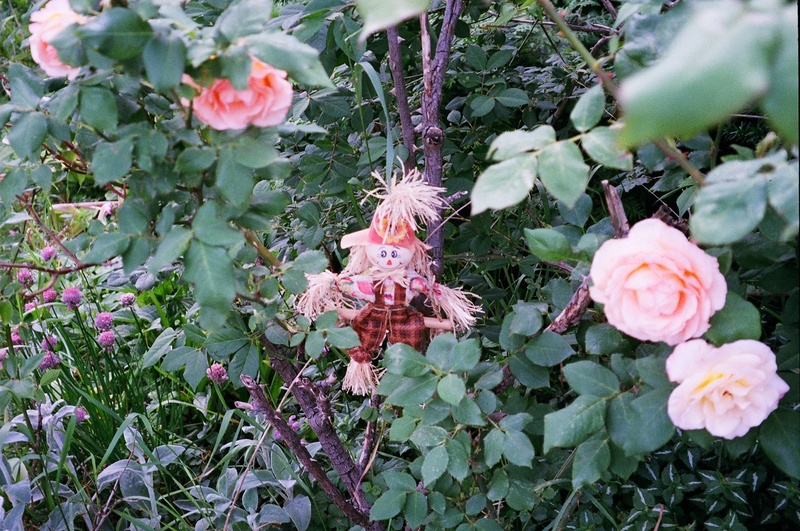 Raggedy Annie among the rosebushes is in the background. 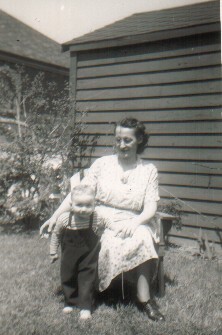 Only Child as a toddler in the backyard with her late Mom who is sitting in the Muskoka chair. 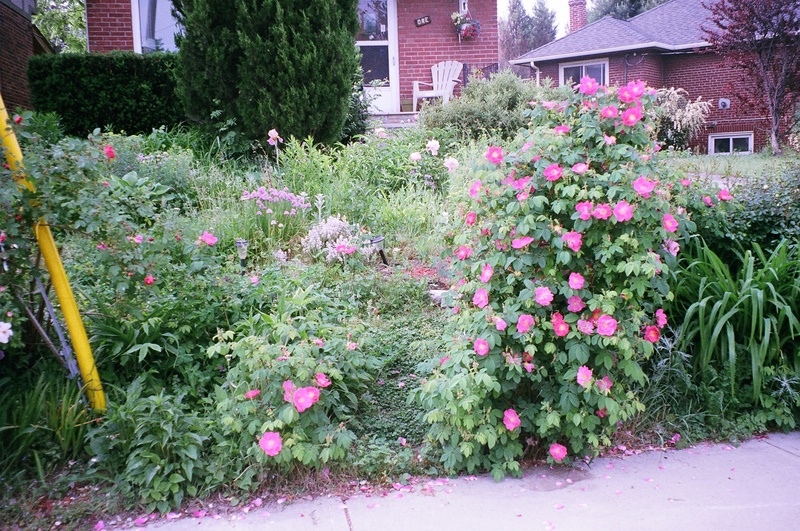 Longshot of Only Child’s front garden where she now lives and that Muskoka chair on the front veranda. On sunny summer mornings, she [my late mother] parks me outside with my colouring book and crayons at the card table on the front veranda. I sit there in the slowly receding shade from the house and carefully pick out crayons to colour in the trees, flowers, people, and cartoon characters of my vast colouring book collection. Boxes holding only eight crayons are not good enough; I prefer at least 24 crayons because then I can pick out different browns for the hair and different greens for the grass and trees. I pull out a crayon, lift it to my nose to inhale the waxy smell, then apply it to the drawings of people and places. I make sure my crayon stays within the outline and that I shade evenly. No wisps or coloured lines scattered all over the page. Already I am realizing that I need some order in my life. But not without the spontaneous sweetness of nature. Often I lift my head from my shading to stare at the green grass and trees along the block and listen to the birds tweeting. Occasionally, a neighbour strolls by. We don’t wave or say “hello,” but I sense the peacefulness, not just between us, but overall. The neighbourhood is quiet now and I need to absorb this. It is more than just breathing – it is my reboot into living after confrontations with the Bully. Of course, I don’t figure this all out then. I am just content to soak up the moment without any angry outbursts. In the above, I am cooling off from much more than hot weather but from yet another encounter with The Bully. However, on these hot humid summer days, we are more concerned with keeping our cool in another way. You’ve probably all seen those newscasts of parents leaving kids in steaming hot cars while they went inside an air-conditioned mall to shop. Or someone left a dog in an overheated car. Are these people stupid, careless, or has the heat gotten to them? You never leave anyone or any animal in a hot car in the summer if you will be away from the car for more than the time it takes to fill the car up at a gas station (and then you are right there). If your car has air conditioning, it goes off when you turn off the ignition. Just think hot seat when you return to your car and sit down. In fact, if you leave your car in the heat, take your children and dogs with you. The mortality rate from heat exposure (not just in cars) is higher than dying from a lightning strike or a flood. In the United States, the average fatality rate for death from heat wave exposure is 400 a year. And during the Chicago heat wave of 1995, about 600 people died from heat exposure within five days. Check out the Wikipedia article and its references at http://en.wikipedia.org/wiki/Heat_wave#Mortality for more information about the perils of heat waves. Today, tomorrow and Thursday, I am going to restrain myself from excess walking and even heavy gardening. When I see a weed (or two, or three, or…) I will say “on the weekend.” Instead I will sit in the shade and enjoy my garden or sit on the veranda, as I do most mornings with my coffee, now that I have a Muskoka chair – shades (pun intended) of my childhood. After an intense session of editing or writing (rewriting more likely) inside (air conditioning on when necessary, although I try to use open windows, fresh air and ceiling fans only, when possible) I need the change to absorbing beauty, calm, peace. 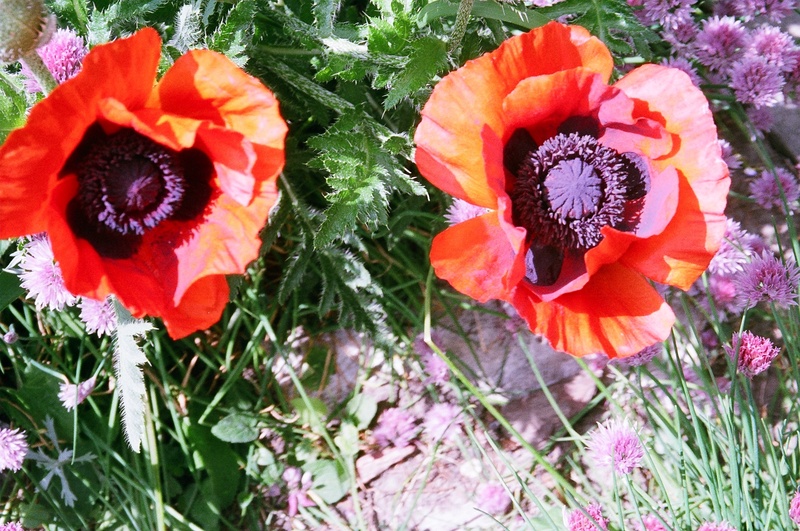 More garden photos from this month are posted below. Enjoy. 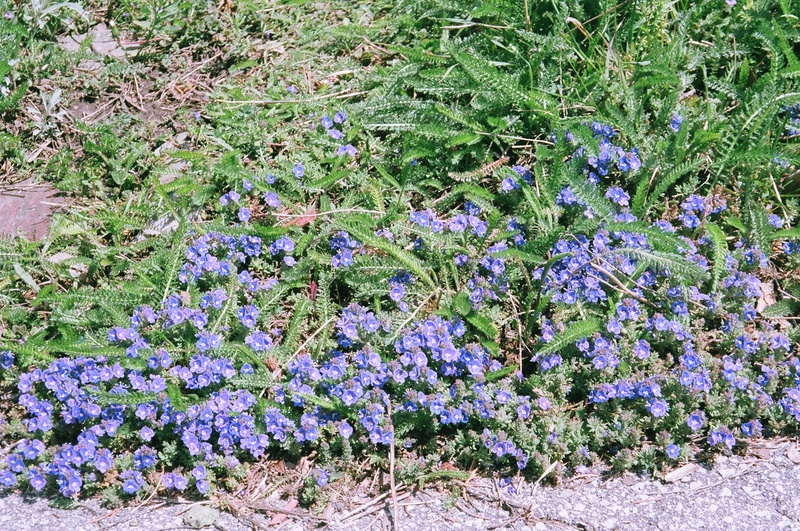 Blue sea of Forget-me-nots which popped up in May – now finished for this season. It is happening frequently. I find yet another woman, 60 and over, living alone who has escalating health issues. Last week, it was a writing colleague just diagnosed with Diabetes 2. She’s had some scary “nearly dying” experiences. Another writing colleague has food allergies and a thyroid condition. Yet another has thyroid and eye problems. Still another has had many eye problems. Then there is my friend with the back problem who was mentioned in a recent post. And me –maybe I have some nerve complaining of my health issues compared to what other women have to contend with. For what it’s worth I have a lot of foot problems, IBS, osteoarthritis, and allergies. Mind you I’ve had the allergies for over 20 years, so that isn’t a seniors’ health issue. These women and their health issues are only the tipping point of the list. Does something about older women living alone bring on these health problems? Is it hereditary? Is it age? All of the above, I think. I also believe that living alone can aggravate these conditions. When you have to cope alone and there is no one to lean on/to give support, the coping mechanisms go down, down, down. The “hope factor” also can take a big dive. In the journal article “Perceptions of Living Alone Among Older Women” written by Elaine M. Eshbaugh of the University of Northern Iowa, 30 per cent of the women interviewed (there were only 53, so not a wide variety) were afraid of falling or getting hurt. Eshbaugh also cites previous studies which found a couple of horrors – older women living alone are more likely to suffer from falls and other injuries, infections, and dehydration. When the medical services finally arrive they often find the women already dead. It’s not a case of who you going to call but who is going to call? The article also cites a study of a group of older women with deteriorating health who lived alone in Baltimore. These women’s health became worse than their counterparts who lived with someone. 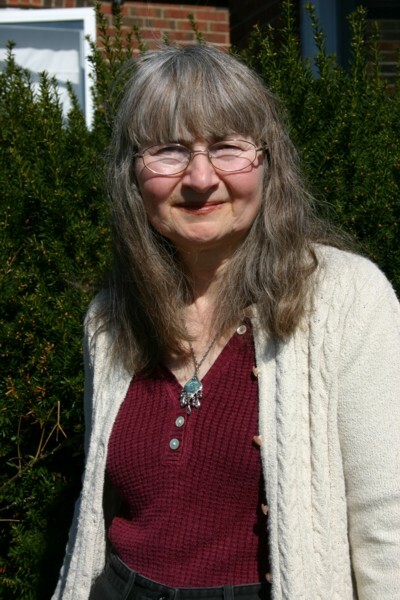 The article was published in the Journal of Community Health Nursing in 2008 and can be viewed online at http://www.uni.edu/csbs/sites/default/files/u27/perceptions%20of%20living%20alone.pdf and also goes into the cultural aspects of why more women live alone now than in the past. I find it interesting that the article’s title uses the word “perceptions.” This conjures up more questions: how much of ill health is related to our perception? If we always had a positive attitude about our health would that keep the health and injury issues away? Remember the 1960 movie Pollyanna starring Hayley Mills? Pollyanna fell when climbing down a tree and became paralyzed. 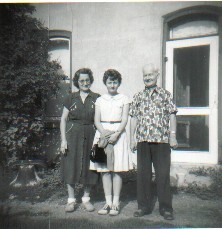 But…Pollyanna had close family and friends (including the stern aunt she lived with) for support. Maybe “support” is the crucial factor. “Support” as in living with someone who is at least there if you fall, have a heart attack or suffer the side effects of chemo treatment for cancer. Just someone for the moral support can lessen the worry burden of going through the illness journey alone, although if my late mother were still alive she might disagree. After Dad died, Mom’s health deteriorated – arthritis and scleroderma appeared – she landed in the hospital several times, had to quit her job and was constantly in a negative complaining state. I lived with her and while I listened, I was in my late teens and early 20s, and definitely not my father. Or maybe after years of dealing with Dad’s cancer and other illnesses, once he was gone, she just gave up. I’m also not sure my yo-yo attitude is the right one. I jump from worrying about the current health issue flaring up to being defiant. I will go for my walks and garden despite my foot problems. I will eat well and healthy despite my food allergies…but I am persistent in making sure I don’t get what I can’t eat when dining out. I’ve come a long way from when first diagnosed and I attended a meeting of volunteers. The only snacks available were baked goods (I’m allergic to wheat, barley and rye for starters). I remember the hostess, an elderly woman who lived alone, asking me “Well, what can you eat?” I’m not sure if her living alone is connected in any way to her take on food allergies. But this was 22 years ago when food allergies weren’t all that well known. However, today, despite all the publicity and change in gluten-free, dairy-free, etc. food available, there are still some people, particularly in the restaurant business, who are clueless. I won’t eat in some restaurants because of this attitude. Thank goodness many restaurants do go that extra mile to make sure that I, and others like me, don’t eat something that will make us sick or in some cases, kill us, especially if we live alone. We might not make it to the phone to call 911. I don’t know what the answer is. Maybe it is partly something I mentioned in an earlier post. We need to connect more with our friends, particularly the older women living alone, to make sure they are all right. I’ve been guilty of not doing this because of the time factor. Perhaps this whole issue needs a slight switch in mindset – both on the part of the women living alone, their friends and family and yes the healthcare systems. Dumping sick and old women in a nursing home isn’t always the answer, although sometimes it is necessary, unfortunately. I’m also wondering if in finding keys to living longer, we (the collective “we”) have not made it more difficult in some ways for older women living alone to enjoy life as much as possible. In my short story, Road Raging, I ask the question “Do we land in situations by chance or does someone out there direct the traffic?” Events this weekend in Toronto vis-a-vis where I was had me thinking seriously about this question. And growing up Catholic also factored in. Toronto also had another situation Friday and into the late evening. After a dry spell, Toronto received torrential rains which flooded a main subway station – Union Station, which is also the hub for Go trains and VIA rail and Amtrek trains. The railway train tracks were okay and except for some water on the lower Go train commuter waiting area, the main part of the station was basically okay. The flood was on the subway tracks, subway platform and main area of the subway station– some rain pouring down the stairs from the street. A sewer problem either compounded or caused it. Both Friday and Saturday I attended the Bloody Words crime writing conference in downtown Toronto. I was bemoaning the location being just a bit out of the main downtown core until the Friday. When travelling on the subway I heard the announcement about the flood and that subway trains were not running under the main street (Yonge St.) from Union Station to Bloor Station and were turning back on the other line at Osgoode Station. My stop for the conference was Osgoode Station and then it was a three or four minute walk to the hotel. The service resumed while I was on the way home – after I exited the subway for my bus. Fast forward to early Saturday evening with the pre-banquet reception. As I milled around and chatted with other crime writers and readers I heard somebody mention that a shooting had occurred at The Eaton Centre. She said that maybe we should go there (because of our writing focus) but none of us did. Just as well. After the banquet I caught up on some of the news. The subways were not stopping at Dundas Station and Queen Station (the two stations encompassing The Eaton Centre) and The Eaton Centre was closed. Being a writer I had to nose around a bit even if from a subway. I took the subway line around Union and up Yonge. At Union I leaned into the window (can’t lean out – windows don’t open) to check the platform. No water remained but I could see a big mop. Queen and Dundas stations looked eerie in their emptiness. At Dundas I could see a police officer by one of the exit doors to the subway platform. Back home I watched the news – full screen (those small iPhone screens don’t cut it with me) and realized the seriousness of the situation. I saw the panic; the terror and when I heard that one of the random victims was a 13-year-old boy, I think that’s when it hit me. There but for some grace I go. If the conference location had been at its former place there would have been no subway running by it Friday and Saturday and we’d have surely been in the crowd outside – that hotel is right next to The Eaton Centre. Makes you wonder – is somebody out there looking after us?